Demolition Atlanta your top demolition contractors - offer a great variety of services to cover any of your construction needs. ​Taking care of that old building, home, or construction of yours is our only concern and while we are pretty proud of our professional work, we are extremely strict when it comes to safety procedures. 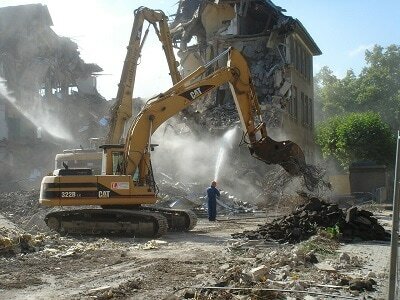 ​Make sure you speak with us first, before you move ahead with any demolition contractor in Atlanta. Not only do we always outbid everyone else, but we also offer a much greater deal which covers other parts of the demolition process (such as the debris cleanup.) Getting the building teared down is one thing, but taking care of all the concrete and all the brick that will be gathered, is a whole different beast. Many times it can become very expensive and unfortunately some companies do not offer price breaks. So have faith in the most experienced demolition contractors: the ones that will save you both a lot of time and a lot of money. These type of projects have become our daily routines so it's not as risky or dangerous as they sound. Also, we don't just offer our services for only specific project sizes. We can pretty much take care of the small garage that needs to be torn down up to the 100,000 sf four story commercial building that needs implosion demolition. 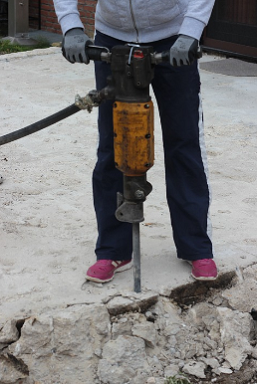 Our crew is always well equipped for either scenario, and we have people that specialize in specific areas of demolition. So we may bring along an asbestos abatement talent, or some very skilled excavator operator. We pretty much are the best demolition employers in Atlanta (and beyond) so we get the best type of people working on these projects: both good in their skill set and good as people. Honest, integrity and a love for what we do is guaranteed. You will in no way see (not even a single day) someone that is "not in the mood" or has a lousy behavior. Everyone is exactly the way they are supposed to be, making sure everything is being completed on time and on budget. On top of that and as an addition to what I was saying about having phenomenal people working at these projects, the demolition techniques used are very very safe and sustainable towards the neighbors. In an implosion strategy, we will make sure the building falls down to its foundation. We haven't ever had a building that fell over creating damage to property that is near. We always make sure everything stays within the perimeter. And even when talking about deconstruction (in which case someone would assume more flying debris would be existent,) we are extremely careful with the work being done so that it is precise. You won't see any bulldozers swinging those blades and teeth recklessly in the air, smashing the concrete all over the place and causing damages to other properties. Thank you for choosing Atlanta Demolition Services!